Converse goes big this year with their largest multichannel campaign ever. The famous Chuck Taylor shoe exists 100 years and Converse celebrates this with a worldwide on-and offline marketing campaign. 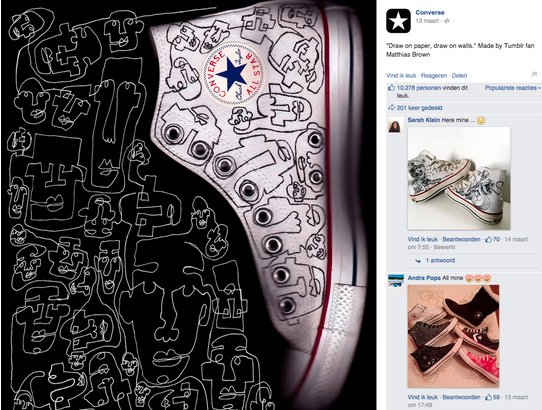 Converse uses a mix of online and offline marketing channels for its latest campaign. A combination that ensures there isn’t a way around the brand for customers. Read here how they realise an increase of almost 200% on their social media channels. Converse celebrates the birthday of the shoe with the ‘Made By You’ campaign that puts a spotlight on unknown ‘sneaker heads’ and iconic Chuck Taylor wearers. 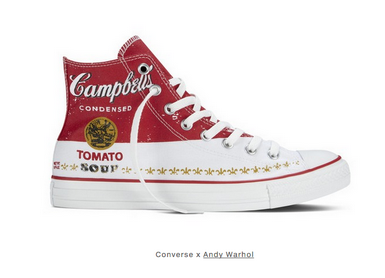 Converse started a cooperation again with American Pop Culture Icon Andy Warhol. He is known for using the Chuck Taylors as a canvas in the ‘80s. For the Made By You campaign, Andy Warhol created Chuck Taylors painted with ads, newspaper cuttings and soupcans. All sneakers were customized with the unique style elements of Pop Art icon Andy Warhol. Converse allows famous and a little less famous fans to express their love for the Chuck Taylor shoe in their ‘Made By You’ campaign. In our weekly Social War measurement, the engagement of Converse with it followers shows a huge increase. Since the start of the campaign the PTAT of converse has grown with very large numbers, for three weeks in a row . At March 13th a PTAT of 89253 is measured. This is an increase of +176% in comparison of the average. at March 20th a PTAT of 77527 is measured. This is an increase of +153% in comparison to the average. At March 27th a PTAT of 93741 is measured. This is an increase of +185% in comparison to the average. Converse celebrates the owners instead of the shoes, and not only the famous Chuck Taylor owners get a chance. 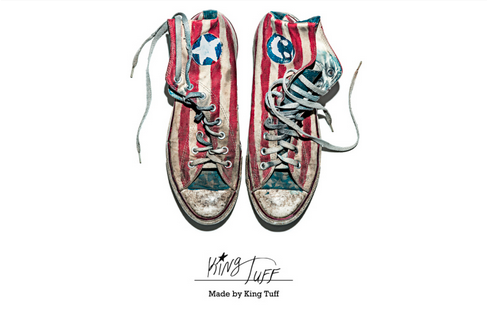 The proud Chuck Taylor owners get a chance to create an online art gallery with their shoes. A community of ‘Converse Sneaker Heads’. What do you and Andy Warhol have in common? You both wear your Chuck Taylor shoes with pride. 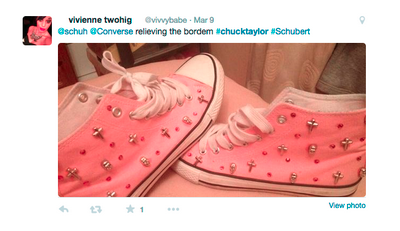 With the hashtag #chucktaylor you are able to put your worn out Chucks in an online spotlight. An unique artwork in the online #chucktaylor gallery on Twitter. 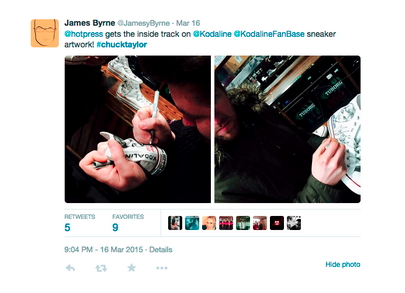 James Bryne, lead singer of the Scottish band Kodaline, places his own #ChuckTaylor artwork on Twitter. 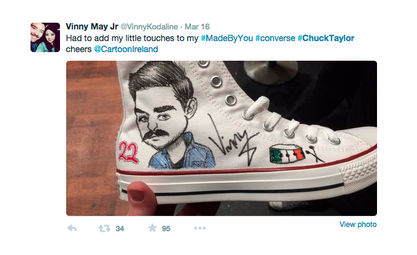 Kodaline’ s Drummer Vinny May Jr also posts his customized Chuck Taylors on Twitter. For the less famous Chuck Taylor owners, there also is a place on #chucktaylor. Made By You is an ongoing campaign for an undetermined period of time. The campaign for Converse creates a community around its shoe. It exists locally and worldwide of different on- and offline components. Converse uses an app, exhibits, pop up stores and serial advertising in all major world cities. With the ‘Their Chucks App’ famous ‘Chuck wearers’ offer a look inside their love for ‘their’ shoe. The campaign is an online and multi channel one but at the same time an offline and local one, with exhibits in cities like London, New York, Beijing and Mexico. Converse opens different Pop up stores worldwide. Even at the prominent music festival SXFW a Converse Pop up store was opened as well. The ‘Made By You’ advertisements appeared worldwide at streets and stations. ‘Made By You’ puts a spotlight on thousands of Chuck lovers and their favorite shoes. It is all about the uniqueness of the shoe and its owner. Converse celebrates the 100th birthday of the shoe with ‘Made By You’. But the campaign is about the shoe in the very last place. It really celebrates their owners. The unique Chuck Taylors of Emily Mason on the Facebook Page of Converse. The unique Chuck Taylors of Rory Pedrick on the Facebook Page of Converse. The unique Chuck Taylors of Hannah Zipporah H. Tayo on the Facebook Page of Converse. Converse celebrates their flagship’s 100th birthday in style. The brand uses an never seen before combination of marketing channels to not only put the sneaker but also its owner in the spotlight. A mix of icons who have worn the sneakers over the years and the less famous but loyal followers. Together they celebrate their shoe and their community. With an incredible high engagement Converse seems to prepare the Chuck taylor for the next hundred years.